Do you know that you are loved relentlessly by God? A relentless love is a love that is constant and never ending. A relentless love is one that will hunt you down and WAIT for you. A relentless love is one that will NOT quit trying. There’s no wall he won’t kick down or lie he won’t tear down coming after you. There’s no shadow he won’t light up or mountain he won’t climb up coming after you. God has always been in pursuit of you. And if he’s got you, whew he’s rocked your world hasn’t he? He sure has mine! He has surpassed any plans I could have ever imagined for my own life. That’s exactly what he wants to do for each of us. Has his relentless love caught you? Has he changed your identity? Has he strengthened and empowered you? That is his desire. Nothing can separate you from the love of God. Nothing can keep him from loving you. Nothing! And maybe you already know that about God’s love for you. I hope so. But may I remind you of God’s relentless love for your child who has gone astray? 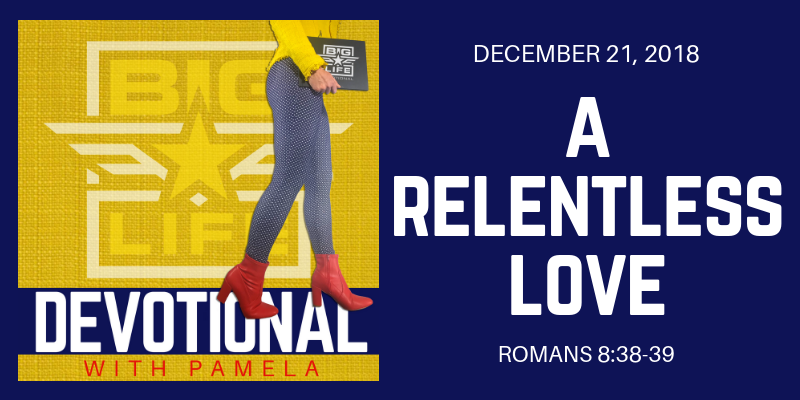 They’re knocking on all the wrong doors and going down all the wrong paths, making more wrong choices than you knew any one child could make … and God is relentless in his love for her. Relentless in his love for him. RELENTLESS. You may be losing hope for this child, but GOD ISN’T! God has a relentless love for that loved one who is royally messing up their life. For that one who is running further and further away. For that one who you just can’t seem to help. Remember God’s love for them is constant and never ending, he hasn’t given up on them, he’s waiting, he’s using everything in their path to reach them, and he will not give up on them. God once called you and I out of darkness. He made our fight his own. AND GOD WILL DO IT FOR HIM TOO. GOD WILL DO IT FOR HER. God will use anything and everything to bring their heart to him. He will use their failure. He will use their disappointment. He will use their addiction. He will use their rock bottom. What we must do is get out of the way of the almighty and let him work. Hand over the battle to God today. Let the same relentless love that chased you down and captured your heart do the same for the one you love who is wandering. Won’t you trust God with this? Won’t you trust that God will carry them and cover them, just as he has carried you and covered you? God’s grace simply amazes me. He takes the most unfavorable and unlikely and turns them into legends for him. Paul, author of the majority of the new testament, a mighty crusader for Christ was formerly Saul. A mighty persecutor of all Christians on a mission to behead any follower of Jesus. Wow, God’s relentless love changed his life! Can’t he do the same for the one you love? David, just a little shepherd boy, too young, too little, too weak to even be in the army, just a boy delivering lunch to his brothers … and God chose him to conquer the giant Goliath. That’s what happens when God’s relentless love gets ahold of you. He changes your identity. He changes your path. He changes your future. Who has someone in their life that needs a new identity because the one they have adopted is all wrong? Who has someone in their life on the wrong path, writing a future that terrifies you? God’s relentless love can CHANGE IT ALL. The same God that changed Paul – The same God that choose David – Is the same God who wildly loves you today and is relentless after the heart of your child. Your husband. Your friend. He has a plan for their life, a destiny in mind, and he isn’t backing down. Not today, not tomorrow. Won’t you place your trust in him?